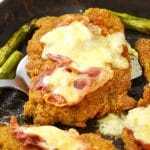 Breaded Veal Cutlets topped with a layer of delicious prosciutto crudo and cheesy parmesan cream. This tastes incredible and is sure to be your new favourite meal! Preheat the oven to 180°/350F/gas mark 4. Place the bread crumbs and flour on two separate plates and the eggs in a bowl, whisk the eggs. Add a pinch of salt and pepper to the bread crumbs and flour then in batches dip each escallope in flour then egg then bread crumbs, press the veal in the breadcrumbs until it’s completely covered. Put 2 tbsp of olive oil in a medium pan and fry the veal cutlets on both sides until browned and crispy (you may need to add a little more oil as you go) Place the cutlets on a baking tray and set aside. To make the parmesan cream, finely chop the garlic and fry in a small pan with a tsp of olive oil for a few seconds to a minute (don’t let it brown). Add the cream and bring to a boil for 1 minute. Turn the heat down low and add the parmesan and a pinch of salt, pepper, and nutmeg, stir. Turn up the heat slightly until the sauce is simmering and stir for another minute until the sauce has thickened slightly. Add a slice of prosciutto to each veal cutlet and spoon over a little parmesan cream (around 1-2 tbsp on each) bake in the oven for 10 minutes until the prosciutto is starting to crisp and the veal is hot and cooked through. Serve with asparagus and mashed potatoes. To make lemon crushed potatoes, roughly chop and boil potatoes with their skins until cooked through. Drain then add back to the pot and add a big glug of olive oil and a squeeze of lemon, salt and pepper. Use the back of a fork to crush the potatoes and serve. *Please note this recipe was tested and developed using metric measurements all imperial measurements are approximate.